Pub in Notting Hill (though its website prefers to place it in Kensington). Inside, it's full of character, with a low ceiling, wobbly wooden tables, wood-panelled walls, worn leather-padded bench seating, bulls-eye glass in the windows, and varnished boards on the floor (albeit also an incongruous patch of red lino). Much of the decor dates from the 1930s, as confirmed by a brass plaque on one wall which gives the origins of the oak used in the panels photo. Perhaps its most unusual feature is the wood-and-glass partitions that divide the space, which would otherwise offer free passage around all sides of the bar. Small doorways in these — all with low thresholds, and some with a high step underfoot — give access to the different areas, some of which are set for diners with cutlery and napkins, and others which are clearly for drinkers. There's a surprisingly large beer garden out the back. When bob visited on a Sunday afternoon in October 2018, arriving around 4:15pm, there were lots of people in eating. When Kake visited on a Thursday afternoon in the same month, there were quite a few people in at 3:30pm, though still plenty of choice of seating; no music was playing. On bob's visit the handpumps were clipped for Sharp's Doom Bar, Fuller's London Pride, Bowland Pheasant Plucker (£2.50/half), and Moles Mole Catcher (£2.60/half). On Kake's visit these four were still on and had been joined by Timothy Taylor's Landlord; and a pint of lime and soda was £1.95. Kake's scotch egg (£4.50) photo was made fresh, and arrived cut in half on a slate with microgreens and artfully-drizzled brown sauce. It was pretty good, with a nice runny yolk on the egg and plenty of texture and flavour to the sausage coating. Child-friendliness: They have a small children's menu consisting of pub classics, with just one vegetarian option. There's a pull-down baby change table in one of the ladies' cubicles (gents' not checked). Accessibility: A small step to get in. Other steps between the different areas of the pub. Steps to the beer garden. Toilets are up a flight of stairs with handrails on both sides almost but not quite all the way up. One of the cubicles in the ladies' is larger than usual. Last visited by Kake, October 2018. 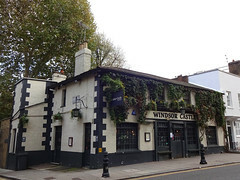 Opening hours taken from the Windsor Castle website, October 2018. Last edited 2018-12-16 14:16:26 (version 3; diff). List all versions. Page last edited 2018-12-16 14:16:26 (version 3).